I don’t often post on Friday nights. It’s such a good night to take a blog break: it’s the end of the week, the end of my longest academic day (8 am – 5 pm nonstop, with a four and a half long Orgo lab thrown in), and there’s always a good chance that the culinary creativity that I brought from the previous weekend into Monday, Tuesday, and Wednesday has run dry. I usually work through my weekends, but there’s a small part of me that likes to set aside either Friday or Saturday for blog pause. Then there are weeks like this week, which felt inordinately tiring. And sometimes the best way to end those weeks are with my two of my favorite things:words and food. Today, I’ll end this endless week with something even better: words, food, and chocolate. I made these cookies for a party last Friday night, and I’d tested them the week before. My goal was to make a cookie that was super rich, but not super sweet. (When it comes to dessert, I’ll always trade chocolate for sugar.) My first batch was to my liking, but actually not quite sweet enough. My second batch, which contained a bit more sugar, was crowd-friendly. If you’d like to taste more chocolate than sweetness here, I’d say to use 3/4 cup sugar (my first test batch was 2/3 cup). If you’re a traditional cookie lover, stick to a cup. 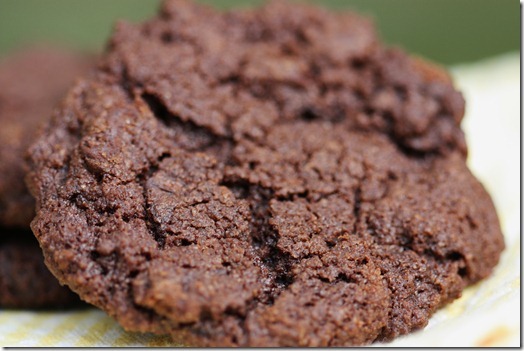 The key to this recipe is the use of really good cocoa powder. I used Navitas Naturals raw cacao powder. The stuff is precious and costly enough that I didn’t love putting it into a baking recipe (I usually save it for smoothies and almond milk hot cocoa) but I must say, it elevated this otherwise standard cookie recipe to new places. Everyone who tried these cookies commented upon the depth of chocolatey flavor. When baking cookies, cakes, and anything for which an omnivore baker would typically cream butter, I personally like to cream coconut oil in its solid form instead. Coconut oil is a saturated fat, which means it is a solid at room temperature and a liquid at slightly warmer temperatures. You can use it in either form, but if you use the solid form you can beat it with a hand mixer as you would butter. It’ll melt, but by the time it does, it will be well incorporated with your sugar and vanilla. This technique is a great way to use a non-Earth Balance, yet solid fat in your vegan baking. With that said, Earth Balance is miraculous stuff when it comes to making authentic vegan baked treats. So if that is your tried and true ingredient, go ahead: it’ll work absolutely perfectly in this recipe. 2) Sift together flour, cacao, baking soda, and salt. 3) In a large mixing bowl, beat together the coconut oil and sugar with an electric hand beater, starting on low speed then moving to high. Beat in the flax egg and vanilla. 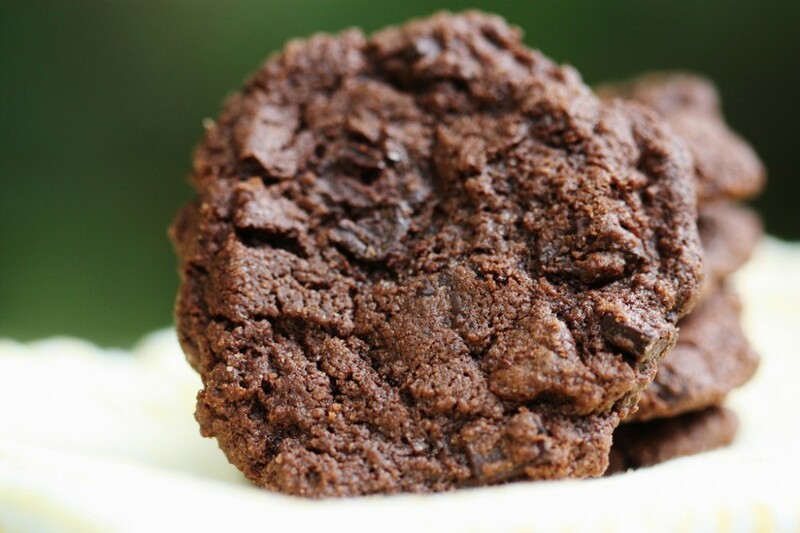 4) Add about half of the dry ingredients to the cookies and keep mixing with your hand mixer. Add the other half, then the chocolate chunks, and mix until everything is uniform. 5) Drop by the tablespoon onto a parchment lined baking sheet and bake at 350 degrees for 10-12 minutes, until crispy at the edges. Remove from oven and let cool before serving. These are heaven on a plate. Or in a stack. Can you make these gluten free? Absolutely. Do I know how? Not exactly. I find that GF baking is easiest in quickbreads or muffins; I’m still mastering cookies and cake. I’d use a GF baking mix, or, if you happen to know a lot about gluten free baking already, use your kitchen intuition. If you happen to have had a long week, too—and c’mon, who hasn’t—I suggest you whip these up. The only thing more rewarding than a homemade sweet is a homemade sweet that is saturated with chocolate. OK. Speaking of saturation (ha! bad Orgo puns!!) I’ve got to hit the books. Happy weekend, everyone. Coconut oil/butter is totally the dairy-free way to go with baking. Also, I bet some banana soft serve between two of these would be really good. Just FYI. Mmm, even if this week hadn’t been excessively long, these would still look amazing! And I completely agree with Victoria about coconut oil in baked goods, but I was thinking more along the lines of some raw whipped cream… Also, for either of you (since I assume Victoria knows her cocoa…), is there another cocoa you would recommend for perhaps a little more economy, but still good quality? These look amazing! I’m assuming you meant 1/2 cup solid coconut oil (or Earth Balance)? Oh god, these are my all-time favorite kind of cookies. I’ve been looking for a good recipe for them–can’t wait to try this one. 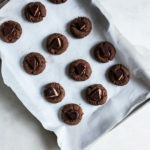 I’ve made Isa Chandra Moskowitz/ Terry Romero’s chocolate crinkle cookie which is awesome, but I’m delighted to try these! Thank you and happy Friday night! I bow my hat to you. I have no energy Friday nights for cooking, let alone typical college stuff. I’m barely keeping my eyes open right now and still waiting to leave the house. I think I need some cookies to wake me up. Oh, these look so yummy! I made your banana muffins for my kids and they loved them!! I’m curious about how you’re finding o-chem to be vs. inorganic chem? Take care! Oh boy, these look delicious. I even happen to have some coconut oil and chocolate powder in my dorm room, so these could definitely happen! Stop creating such delicious recipes– your pancakes, muffins, and so on…..
Gena these look amazing! I love it when you bake. I told you that a couple comments ago when you baked muffins. As for the Navitas…I have only ever used it in smoothie recipes or in tinier batch type things like a half dozen raw balls. Never in bulk b/c like you, I hate to “waste” the good stuff if I have a recipe flop. Sounds like it really made all the difference though. As for the coconut oil…ok so you start with cold coconut oil (solid) and beat it into a warm liquid? Just checking because I’ve found in baking, that whether you start with a solid, i.e. cold butter or purposely liquify/melt butter…and then cream in sugars, it can have a vastly different effect on final product. Whether we’re talking butter, Earth Balance, or coconut oil, just checking to see if you thought that it mattered. From reading your description, doesn’t sound like it but I hesitate to use liquid coconut oil starting off b/c I always worry that it will make everything soupy. GF adaptation for me in these would be half almond flour + half GF flour, i.e. Bob’s blends to replace the WW flour. I don’t like using all “GF flour” b/c it tastes gritty to me usually. Ok long comment. Have a great weekend. I think it worked here because, as you can see, it’s actually not a huge amount of fat for a pretty big batch (so it probably has some soupy effect, but that’s compensated for by the generous flour:oil ratio). It starts as coconut oil the way it is when it’s totally cool and solid, and it beats up nicely, except you can tell as you go that it’s warming up and getting oilier. Does that make sense? Thanks for the compliment–from you, the baking whiz, that is something! Totally makes sense. That’s what I assumed you did in terms of beating it from a solid into a liquid. I think most times that gives better results than just staring off with a totally melted liquid (which results in the soupy effect for me usually) but b/c there is no other real fat source or egg, these could stand up to any liquidy/soupy effect b/c they actually need it. Girl, I have no idea how you survive four hour long labs. You are a champion. These look amazing! Wow–I’m proud of you for indulging in this kind of food and words after a draining week. What is it about this week? It’s been _crazy_! For a gf version of the cookies (loved your talk about creaming coconut oil, btw–right on), I would suggest using the Energ-G egg replacer rather than a flax egg, and using maybe 3/4 cup denser flours (sorghum, rice) and 1/2 cup starches (tapioca, potato). We’re about to be house-sitting, which means access to a proper oven–cookies are the hardest thing to do when you only have a toaster oven–which makes me tempted to try these. I really am not doing ok with chocolate, though 🙁 –enjoying it vicariously through your words and pics. SOrry to hear you had a long week, but glad to know I’m not the only one. These are definitely on my weekend to-do list, this girl needs chocolate! I love your photos, the cookies look so decadent and rewarding. These look amazing! 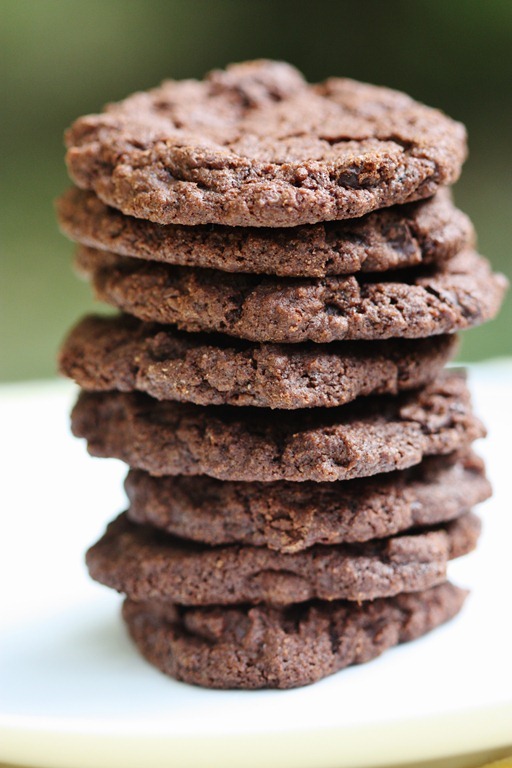 I love it when cookies aren’t overly sweet but more chocolatey! They are seriously mouthwatering. I am ALL about chocolate therapy! Don’t need Blue Cross to approve that one and I think it probably works just as well as any other therapy! Oh, I’m sure you’ll get there!!! Always remember, they’re not going anywhere. Very delicious 🙂 made these with a little molasses added and then 3/4 cup ww pastry flour and 1/2 cup almond flour for a more intense buttery taste. These cookies saved my weekend. the last week has been hectic after losing my passport being stuck in kuala lumpur and not knowing where to go and what to do. A piece of chocolate makes my day. Thank u, Gina! Agreed on Friday blogging breaks, I like to take them to decompress from the week and spend time with hubby. This cookie recipe looks fabulous! While I’m not a huge baker, think I’ll try these for hubby. 🙂 Thanks. I’m a sucker for chocolate cookies. These look wonderful. I’ve started baking for my roller derby team. It’s been a great way to try new recipes without having a big batch of baking left for me to eat myself. They’re going to love these! Love the recipe! I routinely substitute coconut oil for butter without a problem. Actually, with coconut oil I go so far as to cook my omni boyfriend’s eggs or stir-fry’s’ in coconut oil with nary a complaint. I just made these and they taste super delicious! I had not eaten chocolate in a long time, and this recipe was easy to make. Thank you, Gena! To make things gluten-free, I find that a ratio of half superfine brown rice flour and half almond meal replaces flour pretty well in cookie recipes. I’ll have to try it on this recipe soon! Can gluten-free, brown rice flour be substituted for the whole wheat? thanks. I like 1/2 brown rice flour and 1/2 almond meal to keep the “chew” without being too gritty. Thanks. I wish almonds weren’t a food sensitivity because I love almond flour. I’m with you completely on the loving chocolate more than sugar. These are such a gorgeous dark chocolate color. Can’t wait to try them! mmm these look so good! i have used cacao powder in baking and find it’s a different taste level too. Thank you for not just saying, yes, use any gluten-free flour because that just won’t work. People who are experts in GF vegan baking (like manifestvegan and spabettie) have worked long and hard to make sure the recipe works out. You can just assume one thing will work out. I had 2 cookie recipes fail on me in one day. 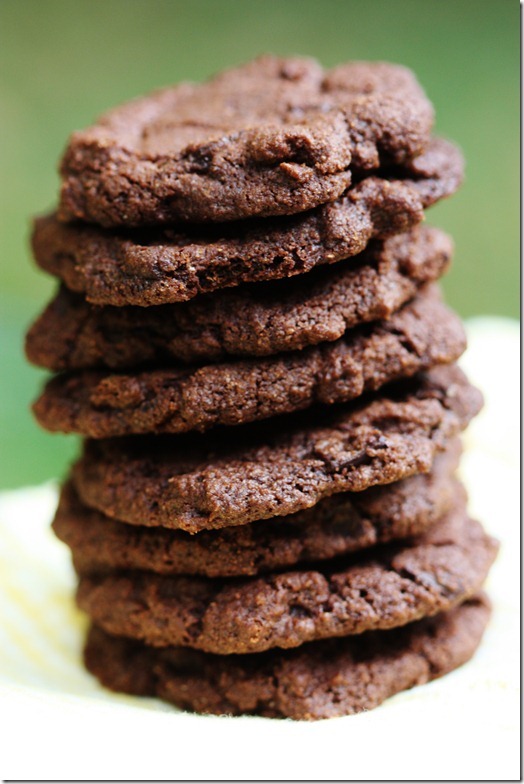 I have to say all the cookies in Vegan Cookies Take Over Your Cookie Jar have worked with GF flour mix for me. Delicious! I did use a GF flour blend and they were a little crumbly, but a little extra EarthBalance fixed that. Terrific! Thanks for letting me know! 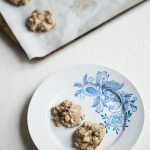 I want to start off by saying that I feel like I’ve only ever left critical comments of recipes on your blog, but it’s not a reflection of how I feel about the blog, because I love it and have definitely had more hits than misses with your recipes! Not to mention all the neat foods you’ve inspired me to try and love (like nut pates and nori rolls, to name a few). Thanks Nathalie! I may go back and note that. Appreciate the feedback. Hi…I had the same problem. Used Earth Balance and EnerG and 3/4C sugar but my batter was very crumbly. Added a bit of liquid but the cookies are still a bit dry. I am going to try the coconut oil next time. The flavor is wonderful though; I hope the coconut oil will help next time! I love raw desserts. They all seem so tasty but so complicated to make :(. I have only tried chocolate pudding so far but hope to improve :).